Ilma has painted an important story for the Omie who live in the Gora valley region between Huvaimo (Mount Lamington) and the Hydrographer's Range. This is the story of a Spirit-cannibal (who is a Misaje' clan man) hunting the Nyoniraje' clan man at Uborida (Jordan River). These events occurred in lands just to the south of Gora village. The nyoniraje man put the cockatoo feather-spring in his hair and left the village just before daybreak to hunt for fish in the Uborida river.There was a Misaje' clan man whi was a Spirit who saw him coming down the path. At the swimming hole called Maruro, the Spirit Man jumped down the waterfall called Juoho and hid behind it, waiting to attack the eat the Nyoniraje' man. The waterfall (jov'e tahur'e) and the stones with spotted markings around the waterfall (ja'ino carticarti) can be seen. The Nyoniraje man saw the Spirit Man was going to attack him so he ran from him to a village called Da'o. The Nyoniraje' clan man left a footprint in the stone at Uborida. 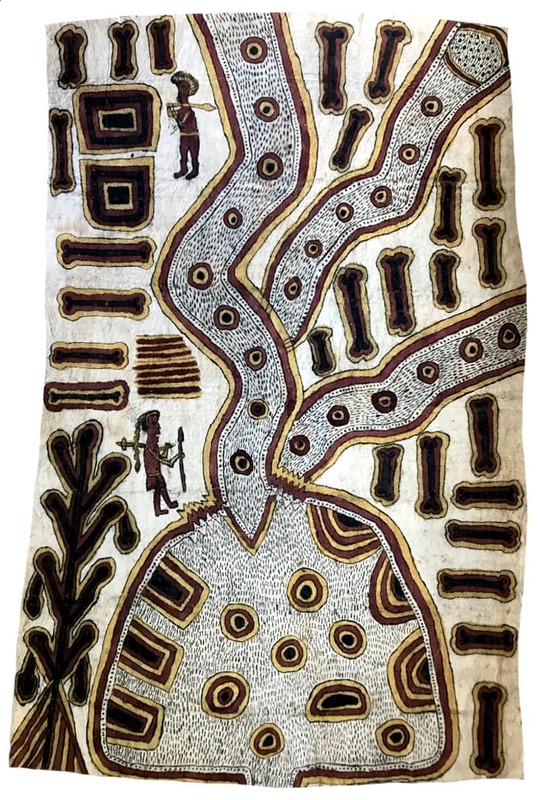 Several sacred sites related from this story can be seen in this painting including Maruro swimming hole, the waterfall juoho and the stones with spotted markings around the Juoho waterfall site. Ilma says the spirit-cannibal's teeth are black from chewing betelnut.